Technique of applying thick layers of paint to the canvas. In fine art, the Italian word 'Impasto' (dough or paste) denotes a painting technique in which undiluted paint is applied so thickly (like toothpaste) onto the canvas or panel (often with a palette knife) that it stands out from the surface. When using this impasto technique, the artist often mixes paint on the canvas itself to achieve the required colour. Oil painting is most suited to the impasto method, due to the viscosity of oils, their thickness and slow drying time, although acrylic paint or even gouache can be applied in the impasto style. Tempera is too thin to be impastoed without adding bulking or thickening agents (eg. Aquapasto). The impasto painting method offers the artist several advantages. First, its raised surface causes light to be reflected in new ways that the artist can control. It was used frequently to mimic the broken-textured quality of highlights - that is, the surfaces of objects that are struck by an intense light. 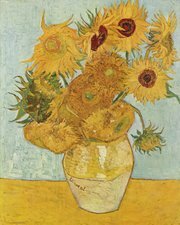 Second, expressionists (notably Van Gogh) used impasto to convey feelings and emotion. Third, impasto can convey a three dimensional impression. Baroque painters like Rembrandt, Hals and Velazquez used minutely and painstakingly worked impastos to depict lined or wrinkled skin, folds in robes, or the glint of jewellery. Lastly, the rough texture can draw attention to certain points or aspects of a composition. Modern exponents from the eras of Impressionism (c. 1870-80), Expressionism (c.1905-30), Abstract Expressionism (c.1948-60), Neo-Expressionism and other styles of contemporary art have frequently resorted to impastoed paint to achieve specific effects. The Dutch-American abstract expressionist Willem de Kooning, the Russian-French colourist Nicolas de Stael and German-born painter Frank Auerbach are three such exponents. The impastoed paint on Auerbach's paintings, in particular, can be as thick as a bread crust. Since then, impasto or any similar method of applying thick layers of pigment paste to a canvas have become a staple technique of abstract and semi-figurative art. Other famous artists known for their impastoed paintings include: the 'Action Painter' Jackson Pollock, the French Impressionist Pierre-Auguste Renoir, and the Expressionist Vincent Van Gogh. The technique is also used by famous Irish artists such as: the Neo-Impressionist Arthur Maderson, the Irish landscape artist Donald Teskey, and the Impressionist Roderic O'Conor.  Impasto can be applied with a brush or palette knife. The paint itself can be used straight from the tube, or diluted, to make it malleable yet thick enough to stand upright.  When thick layers of pigment are left to dry slowly, wrinkling or cracking of the paint film may occur. To avoid this, use a fast-drying alkyd medium or one specially designed for impasto work. These mediums thicken the paint without changing its colour, expedite the drying process and make the paint go further. Excessively oily paint usually makes it awkward to achieve highly textured impasto brushstrokes. In such a case, squeeze the paint onto absorbent paper and leave it for a few minutes. The paper will absorb the surplus oil lending the paint a stiffer consistency.  Flat bristle or synthetic brushes are ideal for impasto work, because they hold a lot of paint. Load your brush with plenty of colour and dab it onto the canvas, working the brush in all directions, thus creating a sculptural texture.  For extra texture, mix sand and sawdust with oil paint to create a highly impastoed surface. You can also make expressive marks by scratching into the wet paint with a palette knife, the end of a brush handle or any sharp tool.  If your oil painting becomes clogged with too much paint, the surplus can be removed when still wet by a technique known as 'tonking'. Simply place a sheet of newspaper, toilet-tissue or other absorbent paper, onto the overloaded area and gently smooth with the back of your hand. Then peel off the paper, lifting the excess paint with it.  Once your impasted layer is completely dry, you can glaze over it with a thin film of paint mixed with a glaze medium. However, in order to prevent cracking, the glaze medium must contain more oil than the layers underneath. For more painting techniques, see: Foreshortening and Grisaille.